Foliage Design Systems creates living greenwall and interior greenwall for businesses in the Palm Beach Gardens, FL area. Whether you own a country club or an office building, including green in your interior design can have a host of benefits for you and your employees or clients. Having living walls of beautiful greenery is both striking and eco-friendly. 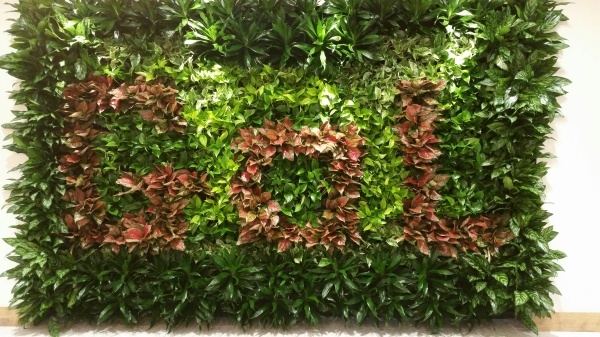 Visitors to your building will never forget the striking vertical gardening! We provide a wide range of services to keep your living walls looking beautiful and your experience stress free. Our team will both design and install your greenwall. We also offer maintenance services, so you never have to worry about your wall of plants or living wall planter. We can also provide special holiday designs and décor. Contact us today about having living walls installed in your office building, country club, apartment building, condominium, or private home. We’ll give you a free consultation.